For several months scaffolding was erected in sanctuary to allow for access for investigations of the rose window. It was determined to be no longer necessary and Mike Oades and his team were able to take down the scaffolding. . The timing was fortuitous because every seat in the sanctuary was needed for last Thursday’s Momastery event. Glennon Doyle Melton is one of many illustrious authors and speakers that First Church has hosted over the years. Past lecturers include Dr. Edward Krehbiel, a Stanford history professor and member of Wilson’s post-war peace settlement working group, in 1918, the scientist who discovered the charge of an electron and Nobel Prize winner Dr. R. A. Millikan in 1923, Russian royalty and UCLA professor Prince Andre Lobanoff Rostovsky in 1933, and many many more. We look forward to more lectures that bring current subjects to the forefront and make the First Congregational Church a meeting place for not only religious but also intellectually and emotionally challenging discussions. This week the preservation team put together a new encasement for the Koinonia room. This one features a teardrop window that was removed from the east rose window. In it you can find examples of almost every kind of damage inflicted on the panes: cracking, broken pieces, soft/bent leading, chips, losses, a poorly constructed patch, and several BB gun holes to top it off. In honor of the windows currently under restoration, here is a bit more information about the creator of our stained glass windows, Joseph Evan Mackay. Many thanks to Bob Kalayjian who spent countless hours putting together such a wonderful trove of information! Sketches for east rose window angels, Joseph Evan Mackay, 1913. Joseph Evan Mackay was a Scottish emigrant born in the 1864 who moved to New York City in 1884. He worked with John LaFarge for three years until he began working at Tiffany Glass and Decorating Company. His time at Tiffany was tumultuous. He later sued the company in 1897 for a $17,000 commission he had earned. It is unknown whether or not he was successful in his suit. Magnolia and Irises, 1908, Tiffany Glass, Co. Now at the Metropolitan Museum in New York. By the early 1900’s he had moved to San Francisco where he began to distinguish himself by diverging from traditional European iconography and including Western naturalistic imagery. He left the bay area after a few years and moved down to Los Angeles. In 1905 the Los Angeles Times reported a strike at his warehouse over his hiring of a Japanese glassmaker he knew from his time at Tiffany in New York. Bay as seen from Tiburon (1904) by Joseph Evan Mackay. Now in the Minnesota Marine Art Museum in Winona, Minnesota. His liberal politics must have endeared him to the relatively young First Congregational Church of Long Beach. 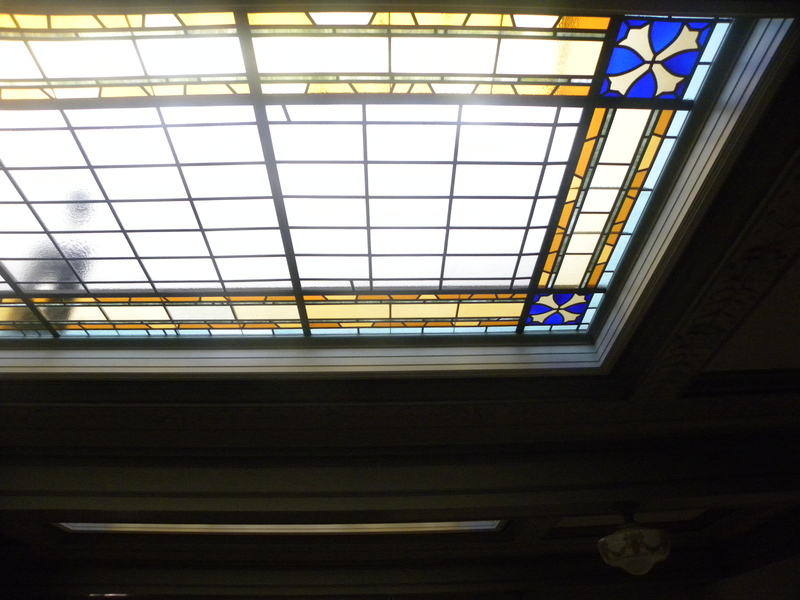 He was hired in 1913 to design all of the stained glass and interior spaces. He continued creating art glass in California until his death in 1938. He is buried in Beverly Hills. Paint, oil and drug review Vol. 24 No. 1. July 7, 1897 Chicago: D. Van Ness Pub. Co.
 “Wouldn’t work with any Jap.” The Los Angeles Times. August, 13, 1905. [Los Angeles, Calif.]: Times-Mirror Co. 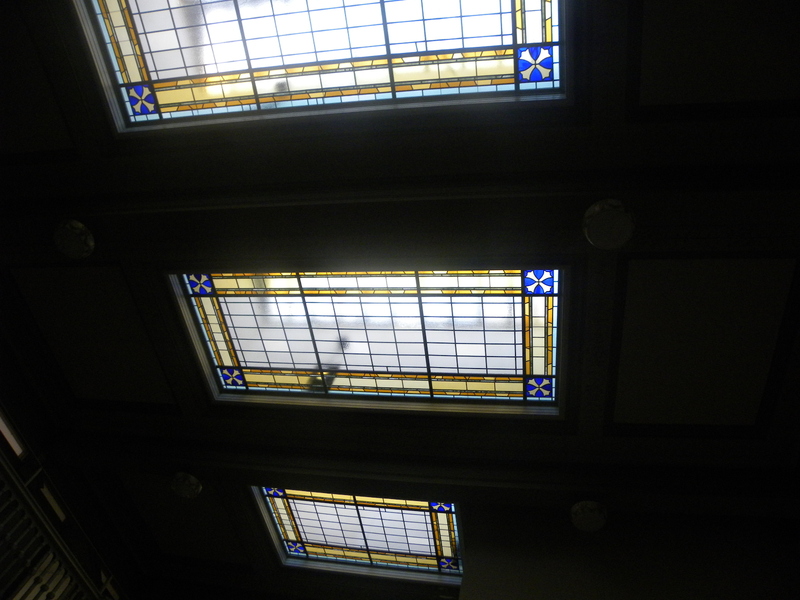 Finally the skylights in the Kononia room are back in place and boy do they look fantastic! Not only was the glass cleaned and sagging in the frame fixed by J. Michael Designs but thanks to Sam Johnson, Yvonne Samarion, and a new volunteer David Eckhous the interiors were repainted and solar powered lights were installed to illuminate the glass at night. 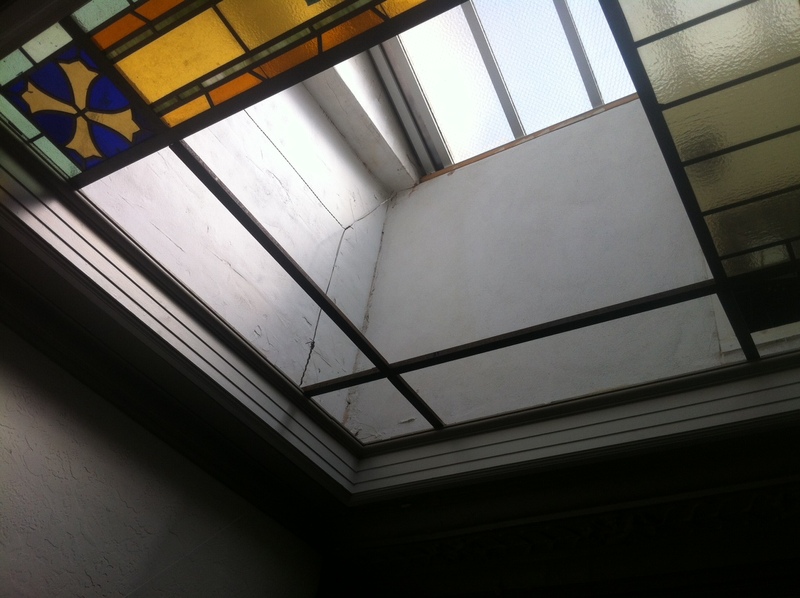 Hopefully their efforts combined with the recaulking the Historic Preservation Committee did Spring of 2015 will mean that the skylights will be in stellar condition for the next hundred years. 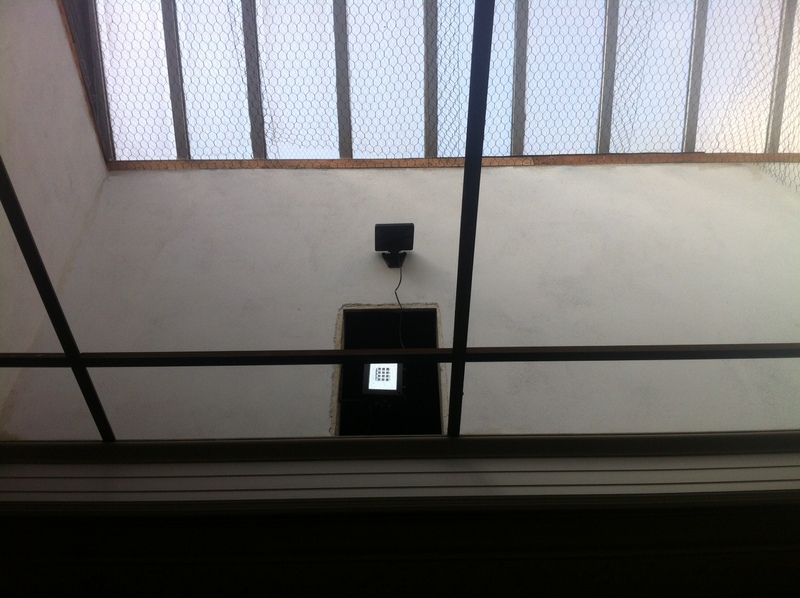 Repainted interior of the skylights. Thanks again Sam! One of the new solar powered flood lights. Look at the intensity of the color! After two years of committee meetings, a congregational vote, and plenty of consultations with experts and city officials the First Congregational Church of Long Beach is beginning its exterior facade restoration project! 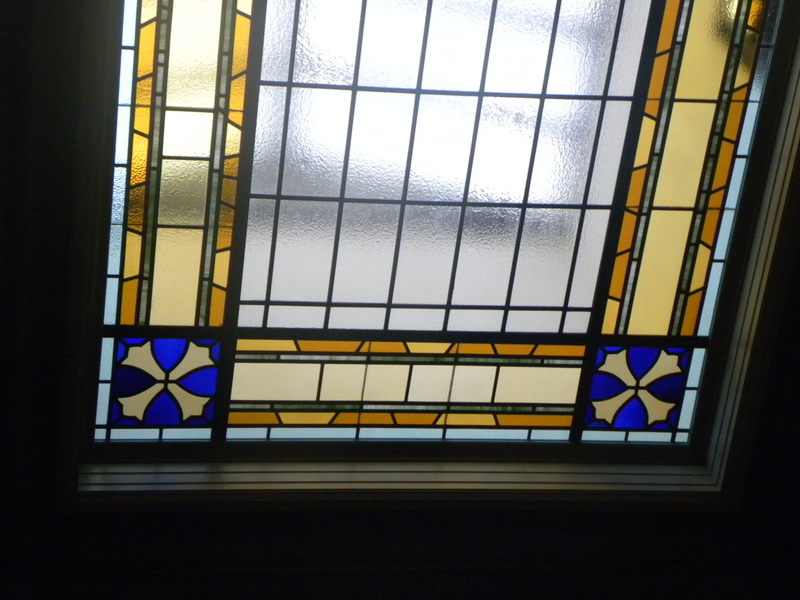 The stained glass removal kicks off the project. It is very important that the fragile glass is out before work on the surrounding terracotta and brickwork begins. The glass panes will be carefully cleaned then removed from the inside using specialized tools and labor. It sounds easier than it actually is. In order to even begin working on the glass panels Mike and his trusty team has to relocate existing pews made of solid mahogany (very heavy!). After removing the pews, a flat platform must be built on the sloping grade of the balcony for the scaffolding to be erected from. Once the scaffolding is erected the windows will be removed, one pane at a time!